Well, as I said the last time we met here...I have saved the hardest tag for last. It really is not that hard, I just forgot how I did it and therefore couldn't teach anyone to make the flower until I remembered. I will suggest that you try this with some scrap paper before you use vintage paper to make the flower. Although, I made a fine flower the first time around...it was the 2nd, 3rd and 4th that were the problem. So I guess it just depends on how daring you are, or how much vintage music paper you have. Adhere ledger paper to tag. I cut the side but ripped to top of the paper (you can see this better in the previous picture). I will stop here for a short tutorial on inking, within the tutorial on tag making. I have received a few emails, "what is that tool you are using with the wooden handle?" If you already know and use this handy tool then you can skip this part and move right on to the tag tutorial. For those that have never seen this tool or have bought one but have yet to open the package...this is for you, so keep reading. The Inkssentials Ink Blending Tool and Foam is the mess-free way to apply inks paper crafting projects. The Blending tool has foam pads that can be changed out easily. NOTE: Ranger also sells an Alcohol ink blending tool (more of a green package). This tool has a felt pad not foam. This will not work for the technique we are using here but replacement foam pads will work on the wood tool since it is the same in both packages. In other words, you have to have a foam pad on the bottom of the wood tool. 1. Place your tag on a Craft Sheet. This is a necessary tool for any crafter. You can paint or stamp on it and it wipes right off, the same with ink and such. In fact, you could even bake a batch of cookies on it...it works like a Silpat baking liner in your oven. I keep mine flat, under my cutting mat on my work table when not in use. 2. 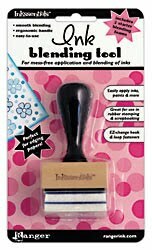 Ink your blending tool by rubbing the ink pad (a circular motion, not an up and down one). 3. 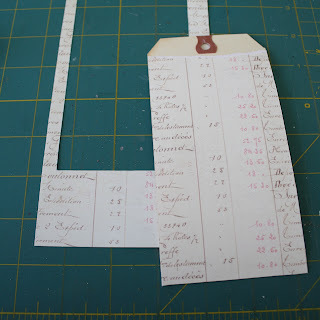 Start your blending tool on the craft sheet and pull toward the tag. The goal is to not have a hard edge, so you need to work quickly and in a circular motion (we are all about wrist motions today). Think of it as if you are pulling the ink onto the tag surface from the craft sheet. Remember, use a circular motion. 4. The blending tool should be a angled a little bit back so the front of the foam pad never touches the tag. 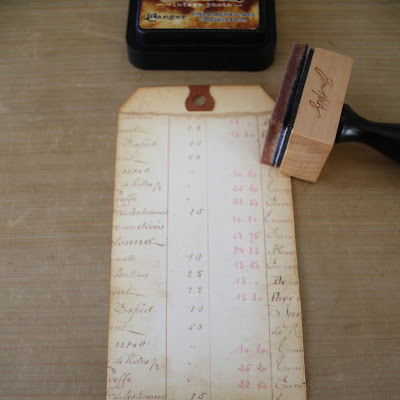 Use a UHU glue stick to glue together 2 sheets of vintage music paper. 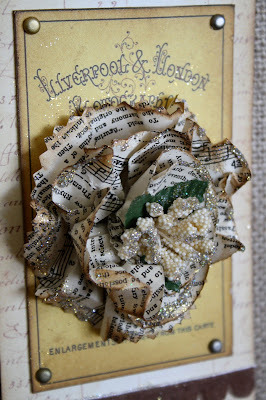 When I made the original flower I used old music but it had come from a book that had very heavy pages. So when I tried to re-create the flower is ripped every time. After about 6 try's I had to walk away and think about what I was doing different. It took a few days but the answer came to me in the shower..."glue two pages together to make it stronger"...It worked on the first try. Draw about a 4" circle on vintage paper (I used a glass from my kitchen to make the circle). You will need a smaller circle so I used the same glass to draw another circle, then I just sketched another circle in the middle about a 1/2" smaller. Cut out with scissors or pinking sheers. Now one more circle about 2" in diameter. Cut a slit in the small circle. Wrap the paper circle around a small bunch of flowers, so that the paper overlaps a bit to make a cone shape. Secure with a bit of glue or a piece of scotch tape. Set aside. Make a pleat in the paper circle and staple. I am using the Tiny Attatcher to staple. Turn the circle and make another pleat, staple again. Set aside. Gather and pinch the center of the large circle. Now gather the large and medium circles. Lay the medium circle on top of the large and punch as close to the center as you can (avoiding the staples) with the large hole on the Cropadile. Now, thread the small cone piece into the hole you just punched for the center of the flower. Now crush it. Yes, I said crush. Crumple it up...now peel it apart to reveal a more compact flower. Don't be afraid, the paper can take it. And if it rips a bit, no worries...remember, were making stuff from junk. Peel the paper open to get the flower to the size you want. You might have to crush again to get it just right. Take your ink blending tool and add some ink to the edges. I used Antique Linen but you can use any color ink you like. I think it looks a little more rustic to add the ink now, but if you choose to ink right after you cut the circle you can. Now lets add a bit of glitter. You can do that two ways. You could use Stickles Distress Glitter (Ranger) and just squeeze it on like this. But, I get really impatient with Stickles because they take a long time to dry in my book (or at least a long time for me)...so I just usually use a bit of Glossy Accents and pour glitter over the top. But that's just me. You can do whatever you like best. Glue a piece of ephemera to chipboard to give it a raised effect. Note: Because I don't like to use original ephemera, I tend to color copy pieces on my home printer when I am doing a project such as this. I can scan and copy the same piece of ephemera on white or creme cardstock and get two different colors of the same piece. I have a couple friends who travel to Europe a few times a year and have been lucky enough to be the recipient of their vintage finds. Just this last Oct my friend Carol brought me four of the cards (including the one seen here) used in the Junk Drawer Advent Calendar direct from London. Poke a hole in each corner for a small brad. Adhere card to tag front with a tape runner. Punch a hole in center of card and thread the flower you made previously into card and through tag. Add velvet scalloped ribbon to the bottom of tag. I believe the one I used is made by Making Memories. Now add it to your board. I've had a fun time showing you how I made some of the tags for the calendar. Feel free to email me if you have any questions about the tags we did not do in this forum. And if you make the calendar we would love to see it, even if it's next Christmas! Love this flower and can't wait to try it! Thank you so much for the fabulous tutorial and inspiration! Gorgeous flower! That is really amazing! Thanks for the tutorial! Yep, it's unanimous . . .this tag is amazing! gorgeous!! thank you so much for all the tutorials... and inspriation! my tag pkg arrived yesterday... and i love it! happy new year! It's beautiful...and your tutorial is great! I was certain I didn't need a Tiny Attacher, but now I'm having second thoughts. that's what I thought too...until I used it. I admit I use it for more than craft projects! It's well worth the $15.99. Wow, great flower. Can't wait to try and put one together. I need to find a source for vintage music paper. Yes, the Tiny Attacher is a must have! Just don't put more than one set of staples in at a time or it will be a mess and clog. Oh, I just love this tag. All of them really. I have been oohing and ahhing over all of them. Thanks so much for sharing all this info. Happy Theresa M. sent us over to see what yummy's you are showing! Very well pictured, thanks!! you definitely saved the best for last.. ;) - thanks for all these coo tutorials.. Thanks so much for telling about the ink blending tool and how to use it!! Sure looks like it would be easier on my wrist than stenciling the edges like i have been doing. Love the flower! I mean really really love it! Your tutorials are wonderful for these devine projects. Great text and super photos. How very, very generous of you to share and inspire. You made each segment like a gift. Thanks a million and have a creative New Year. I do appreciate you taking the time to provide detailed instructions. I love the flower and look forward to trying. And...thanks so much for mentioning that you like to color copy the ephemera. It makes my skin crawl when I hear and see people using the originals. That's a one shot...why not copy so you can use over and over!!! wow - I can't wait to try this one! Its just beautiful! You Rock, Paula!!! So inspiring! I adore this tag! and the junk drawer advent calendar is awesome!